The government has declared 2019 as the target date for every Indian household to get electricity. But a Factchecker analysis reveals that at current rates of electrification, it will take more than four years to provide power to all rural households alone. To meet its 2019 target, the government will need to electrify more than 2.7 million households every month or over four times the current rate of 633,630 per month. More than 78% rural households in the country are electrified, power minister R K Singh told the Rajya Sabha (upper house of Parliament) on February 6, 2018. About 80% of rural households have been electrified as on February 12, 2018, according to the real-time dashboard of Pradhan Mantri Sahaj Bijli Har Ghar Yojana (Prime Minister’s Easy Electricity for Every Household Scheme), or the Saubhagya scheme, launched on September 25, 2017 to electrify all rural and urban households. At the current rate of electrification, it will take four years and seven months for the government to electrify the remaining 20% rural households (35 million households), our analysis reveals, against the government’s target of March 31, 2019. Over 2.6 million households were electrified over four months to February 12, 2018, since Saubhagya’s launch. As many as 16,341 or 89% of 18,452 unelectrified villages have been electrified, according to official data. However, only 8% of these villages have all the households electrified over four years to 2018. The government will need to electrify more than 2.7 million households every month to meet its target by next year as against the current 633,630 per month — an average over the last four months. As many as 239 million people in India — more than the population of Brazil–lived without electricity access in 2016, according to the Energy Access Outlook 2017 report. All of China, Brazil and Sri Lanka had electricity by 2016 compared to India’s 82%. Over 145 million or 80% of (181 million) rural households in India were electrified as on February 12, 2018, Saubhagya data show. 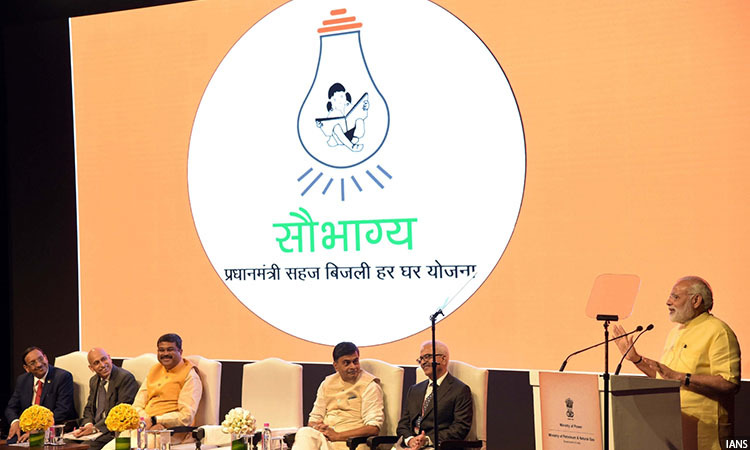 Prime Minister Narendra Modi launched the Saubhagya scheme with a budget of Rs 16,320 crore to provide electricity to all “willing households” in rural and urban areas. More than 40 million rural and urban households were unelectrified across the country as on December 7, 2017. Free electricity connections are being given under the Saubhagya scheme on the basis of the Socio Economic and Caste Census (SECC) 2011 data. “Un-electrified households not covered under the SECC data would also be provided electricity connections under the scheme on payment of Rs. 500, which shall be recovered by DISCOMs (distribution companies) in 10 instalments through the electricity bill,” an official release said. The Saubhagya scheme includes electricity connections to households from the nearest electricity pole, installation of power meter, wiring for a single light point with LED bulb and a mobile charging point. Households located in remote areas are to be provided with solar power packs of 200 to 300 Watt, battery back with 5 LED lights, 1 fan, 1 power plug along with repair and maintenance for five years. “Half a billion people have gained access to electricity in India since 2000, almost doubling the country’s electrification rate,” according to the Energy Access Outlook 2017 report by the International Energy Agency (IEA), a global think tank. The government plans to electrify all of India’s 597,464 villages by May 2018, when it will complete 1,000 days in office. The government had aimed to achieve the target by May 2017, a year in advance, which it missed. At the current rate of household electrification, it will take over four years to electrify all households in rural areas. To meet its target by March 2019, the government will have to intensify its pace to 2.7 million households per month. Over one million households (or 32,827 per day on an average) were electrified in January 2018, the most in the last four months, since the Saubhagya scheme was launched. At this rate, the government will be able to achieve its target in less than three years (2 years 9 months). The least (209,992) households electrified in a month, or 6,774 per day on an average, was recorded in December 2017. At this rate, it will take 14 years to meet the target. The pace has picked up in February 2018: the first 12 days have seen 793,969 household electrified, or 66,164 per day on an average. At this rate about 1,852,594 houses will be electrified in February, and it will take one year and six months to achieve the target. India is the third largest producer of electricity–1,383 terawatt-hour (TWh)–in the world after China (5,844 TWh) and the United States (4,297 TWh) in 2015, according to IEA 2017 statistics report. Despite this, as many as 239 million people in India lived without electricity access in 2016, a quarter of the people without electricity worldwide, down from 600 million in 2000, according to the Energy Access Outlook 2017 report. India’s electrification rate improved from 43% in 2000 to 82% in 2016; people with electricity access increased from 28 million per year between 2000 and 2012 to 41 million people per year in 2016. A village is considered electrified if power is provided to at least 10% households and public places like schools, panchayat offices, health centres, dispensaries and community centres. The government has reached nearly 90% of its rural electrification target, and has now shifted focus to household electrification. “We have changed the rules of the game,” former power minister Piyush Goyal said on May 19, 2017. “Instead of counting a village as electrified if 10% households had grid power, the government will focus on powering every household, thus providing meaning to the concept of antyodaya (rise of the last person).”. “Discoms currently see little incentive in supplying reliable electricity in rural areas, particularly in states where majority of the problem is, as they lose money on each unit of electricity they supply to such areas,” Jain said. Providing electricity connection is not equivalent to having electricity access, Jain said. Field visit has been carried out in your village and factual status has been sent to the DISCOM for the completion of electrification works. Most rural areas in Uttar Pradesh, Bihar and Odisha suffer due to limited power supply. In 2015, 75% of rural electrified households in UP​ received less than 12 hours of supply in a day, particularly in the evening, Jain said, quoting the ACCESS survey that studied energy access in rural households across six Indian states. As many as 45% rural households and 7% urban households were not using electricity as the primary source of lighting, according to this reply to the Rajya Sabha (upper house of Parliament) on August 8, 2016. About 90% of primary health centres (PHCs) in Chhattisgarh reported power cuts during peak working hours, IndiaSpend reported on August 31, 2017. More than 60% of all PHCs in the state reported that childbirths, laboratory and in-patient services were “severely affected” due to lack of electricity.